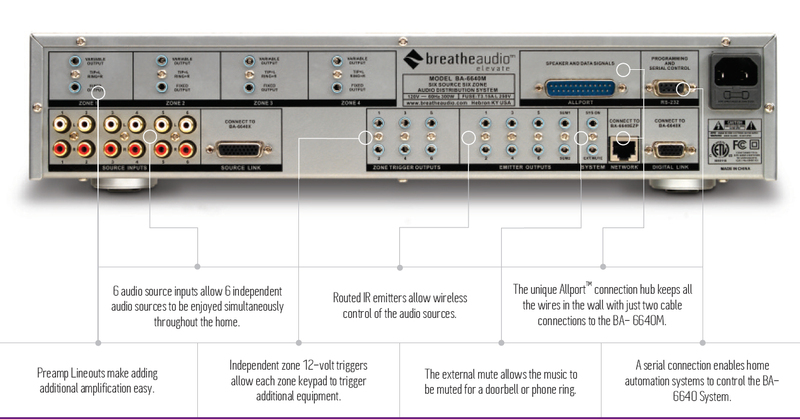 BreatheAudio’s 6 Source, 6 Zone Whole Home Audio System lets the music play, with features that will amaze. The slick, clean styling of its keypad makes for an impressive interface for the consumer, while the Allport provides simple, straightforward installation. All at a price point that makes this 6 source 6 zone system the best value in the marketplace. Get 40 watts of true high-fidelity digital sound for the same price as other systems with half the power or less. Easy expandability to 12 zones provides flexibility for mid to larger installations at an unmatched price point. Amazing Allport connection hub cuts installation time to a minimum with no guesswork to worry about. 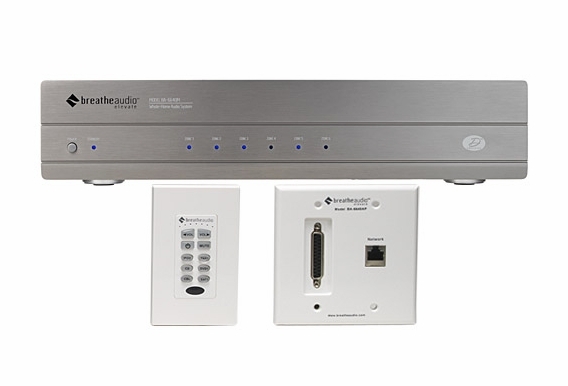 Final installation is instantaneous with VERY simple plug-and-play steps. • 6 audio sources are sent to 6 rooms in the home, and are easily expandable to 12. • 40 watts of power per zone produce high-quality, full highfidelity sound. • Allport connection hub reduces installation time and features no muss, no fuss, behind-the-rack wiring. 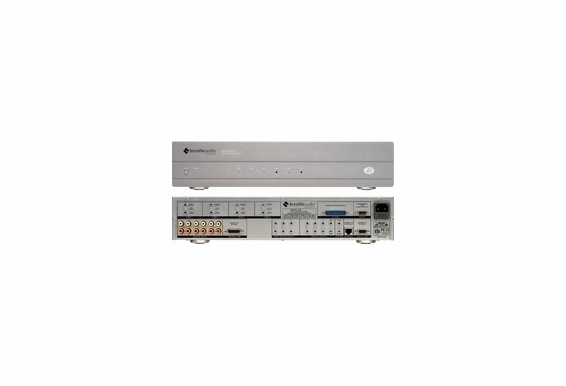 • RS-232 serial port allows for easy home-automation integration. • System has Philips Class D digital amplification, which provides higher output, cooler operation and prolonged life of the system. 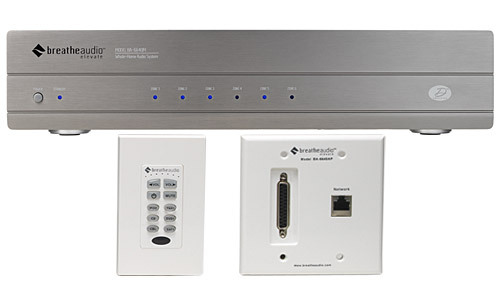 • Built-in IR pass-through at keypad controls source components and offers quick and easy wireless control; specially designed to block interference from sunlight, plasma and fluorescent lighting. • Fixed and variable outputs are provided on zones 1 through 4 to use with higher-powered external amplifiers (BA-200, 200 watt amplifier sold seperately) when greater output is required.
. Preamp Lineouts make adding additional amplification easy.
. 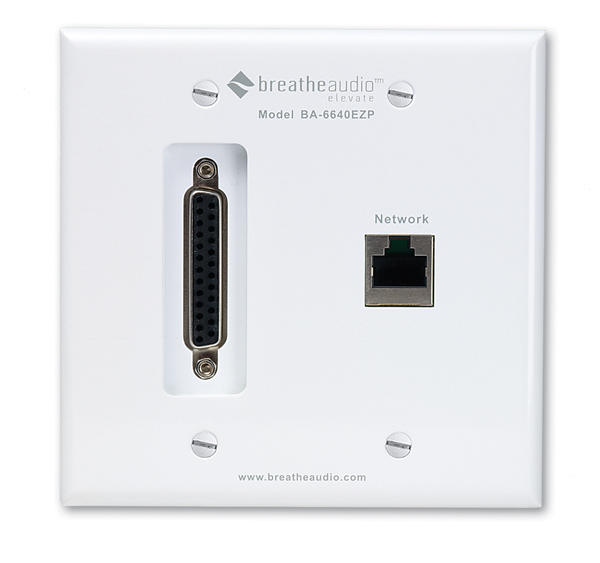 The unique AllportTM connection hub keeps all the wires in the wall with just two cable connections to the BA- 6640M. Independent zone 12-volt triggers allow each zone keypad to trigger additional equipment.
. A serial connection enables home automation systems to control the BA-6640 System.
. 6 audio source inputs allow 6 independent audio sources to be enjoyed simultaneously throughout the home.
. Routed IR emitters allow wireless control of the audio sources.
. The external mute allows the music to be muted for a doorbell or phone ring. 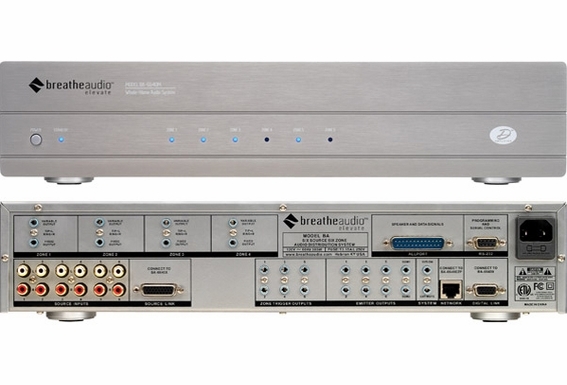 BreatheAudio’s 6 Source, 6 Zone Whole Home Audio System lets the music play, with features that will amaze. The slick, clean styling of its keypad makes for an impressive interface for the consumer, while the Allport provides simple, straightforward installation. All at a price point that makes this 6 source 6 zone system the best value in the marketplace. Get 40 watts of true high-fidelity digital sound for the same price as other systems with half the power or less. Easy expandability to 12 zones provides flexibility for mid to larger installations at an unmatched price point. I'm hoping you can help me. The 8 yr old home we bought earlier this year has a BA-2430. We didn't get much of a tutorial from the previous owners, but other than not having a remote control, it appears to work just fine. My question is whether the system can be upgraded or adapted to work with wireless / smart home options that would let me control the system from my iPhone / iPad. If possible I'd like to be able to select the zones and control the volume remotely rather than adjusting them at the wall panels. Any chance something like this is possible at a reasonable cost? Thank you. was wondering if you could use this system with outdoor wireless speakers....i'd appreciate the feedback as we are looking at this system and planning out as we are having a new home being built. What is the best amp to use to get better sound out of a couple zones. Should I include a sub? Is it possible to control the volume with a 3rd party control such as a mobile app or TV remote rather than the keypad or IR Remote? I have 12 zones and want to know if you can connect 2 systems together? What is included for the price? Amplifier, wall keypads, all-port connector, cables. Are the speakers also included? 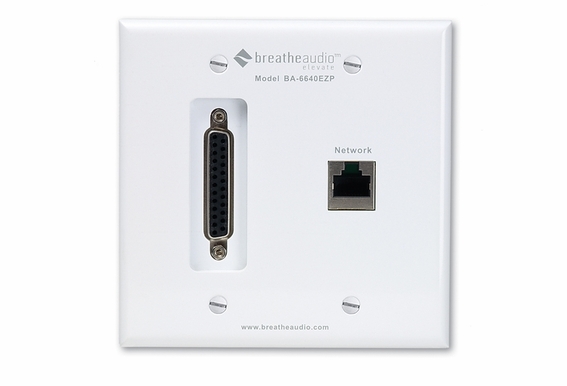 I am thinking of a Ba-6640ms that I would retrofit into a home? I have two questions I would like help with please. I am retrofitting the system into an existing home and would like to install two of the keypads outdoors in a moisture proof box. Temperatures outside will be colder in the winter. Can this be done? I have Bose 151 outdoor speakers which are 4 ohms. Can the Ba-6640ms drive these speakers? Volume will normally only be ambiat level. Appreciate any assistance. Kindly advise me on the amount type of cables I would need to run to all the 4 room with 2 speakers each in them. Hello, Each room will need a CAT5 wire for the digital keypad and two 2-conductor speaker wires for the speakers.. I have 8 zones "home run" to my basement. Each run has a 4-wire and a CAT 5 wire run to wall locations in the zone. From there, in each zone I have the typical speaker wire run from the wall to the ceiling for 2 speakers. I presume this was run this way so that I can attach a volume control on the wall for each zone. 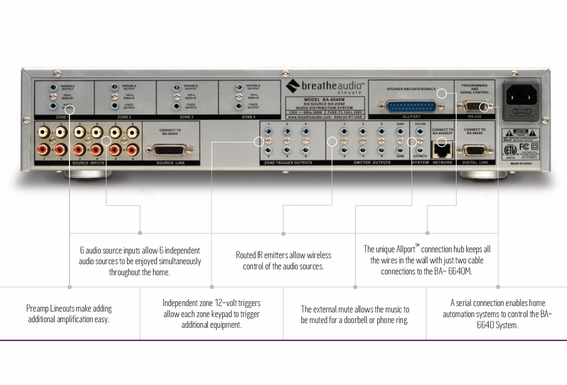 Question: The manual says I need to "home run" each speaker to the All Port. Do I wire nut my 4-wire to my 2 speakers and then connect the home end of my 4-wire to the All Port? Thanks! Hello Lance, Correct. The amp will have a network cable and a power cable running to the All Port wall plate. Then, from the wall plate, you will have a cat5 wire going to a keypad in each zone as well as your speaker wire going to each zone. Is it possible to upgrade the controls on this system? Hi Josh, I don't believe so, but if there is, it's not something we carry. You would want to get in touch with the manufacturer, Breathe Audio (NUVO). I believe you need an amp for each zone that you want more power on if you want to maintain different source capabilities for those zones. If you utilize the AMP200 for multiple pairs of speakers, that will be considered one zone on the Breathe Audio unit, meaning only one keypad will control that. Still great sound, but you would be sacrificing 2 source keypads. Everything else sounds good. What is included with it? Does it include six speakers and all the accessories? Is it possible to use more than 2 speakers per zone? I want to control the on/off and source functions of my outdoor speakers from one keypad, but I have at least 4 speakers that I want to run. Is there a way to bridge zones to one keypad or should I run the wiring in serial or parallel to power the 4 speakers? Love the BA-6640MS! I was looking to add 2 zones to my patio. Can I control just those 2 zones from 1 keypad to create 1 big zone? I was looking to buy the MDS-6A kit, because I have used it in the past and liked it. But it has not gone up in price from when I purchased it last, so now I am looking at other options. Can you tell me what the differences are between that and this one are? This one is so much cheaper, I could almost buy two for the same price..
Hello I am from Australia and I am currently am using the 2 source, 4 zone breathe audio system. I want to upgrade to the 6 source/zone system for additional zones, and also the rs232 port. Will I be able to use all exsiting wiring. i.e is the port connector used in the 4 source system the same as in the 6 source system? I think I can assume that worst case scenario I use all existing speaker wiring, and cat5 back to zone controllers, and use the port connector that comes with the 6 zone? Also, will you ship to Australia? Does this system have party mode? I am thinking of purchasing for a new construction , do the keypads get wired with cat 5 cable? I bought this system for the house I recently built. I wired the system into the unfinished basement where the componets are located. Love the system, but will not finish basement untill next year. Would like to control on-off from upstairs. Is there a wireless controler I can use? I have a wireless router. Following installation all the keypads have a flashing power button and will not work or turn on. Each keypad has its own ID as per the dial on the back. Any suggestions? Does the IR pass through actually let use control the input devices with your existing remote controls, or does it just control the breathe audio system with its own remote. 1.) will the i-port IW-20 be able to hook up the this system as an input source. (it says local zone and this is a multi-zone system) 2.) what speakers will give me the best sound with the systems capability. (indoor) 3. )can i use one input for a theatre room, or will i oly be able to power to speakers in that zone from an amp. 4.) now that this amp is discontinued, whats the best one to use. I'm building a new house and am curious how this feature ". The external mute allows the music to be muted for a doorbell or phone ring." needs to be set up for this device. Can you help?